I ordered a large bunch of flowers for my Mum's bday, to be delivered at a specific time. This request was complied with, which I'm thankful for, however I will admit to being disappointed when seeing the pictures of the flowers. I had specifically requested a mixture of oranges, reds, and greens, however what was given was a few of the above colours, with a whole lot of other colours thrown in - pinks, whites, blues. Somehow the picture I had in my head of what I had ordered was quite different to what was delivered. It was a gorgeous display and my friend loved it. Thank you! Fantastic flowers and ordering was so easy online. Love their stuff. Have ordered from them several times before and always pleased with the result. Great communication, delivered on time and above all a lovely bunch of flowers presented beautifully. Many thanks! Perfect. Just what we were after. Thank you for delivering even though it was after 5pm when we made the order. I accidentally put the wrong address for delivery. I received a phone call, that afternoon, about my mistake, and it was all sorted on the phone. Friendly and a pleasure to deal with. They look great, although not as many flowers as I thought. Beautiful flowers, delivered to the right location, at the exact right time, after getting short notice and during a weekend. The recipients were delighted and so was I. Thanks for being so great to work with. I will definitely come back as repeat business. A very beautiful and tasteful bouquet. Very classy! Beautiful flowers, the person I sent them to, also loved them. Fantastic flowers and fantastic service. Delivered on time and the arrangement was spot on!! Thank you for your amazing service and wonderful understanding. The flowers were beautiful and the recipent loved them. Thanks again and would definitely use All For Love Flowers again and recommed to others. My friend loved her flowers and so did I, they were stunning, just like as picture. Great service, thank you! Order was perfect and delivered on time. Brilliant service. Flowers were exactly as advertised. <br/>They answered my call after hours. Would definitely recommend. Great service and beautiful flowers delivered . Was nice to get e mail saying they?? ?d been delivered and a photo of them. My friend loved them , thank you and would definitely use again. Flowers are beautiful. Fantastic to get a photo of them when otherwise would not get to see them. Fantastic service. Highly recommend. Great service. Beautiful flowers. Really appreciate all the help. I ordered from the UK. The flowers arrived on the correct day and my sister was delighted with them. Beautiful flowers and delivered on the day as ordered. Flowers and bear were perfect. Thank you! Flowers look very pretty although not really like the picture i chose. Would have been nice to get free delivery to the hospital like some of the other florists offered. Thank you. My sister in law was very happy with her flowers. My best friend was absolutely delighted with her beautiful basket of flowers I sent her for her birthday. Thank you so much. The flowers were absolutely stunning and my mum was moved to tears by them. Thank you so much for doing such a beautiful job! Irene was very pleased to receive her flowers and we were pleased to get a confirmatory email with photos. Beautiful flowers delivered. Very pleased. I was hoping for a morning delivery and they arrived late afternoon. beautiful flowers. easy to order online and fast delivery . very easy process from start to finish. I would highly recommend direct2florist to others. Delivery was prompt and the the recipient was very happy with the flowers and chocolates I sent. Thank you and until my next order! First time used this florist. Picked them by their website. Very happy with the ease of ordering from Southern California. Very happy with the entire service. Recipients loved the flowers. I cannot comment on the flowers as i was not the recipient. However my family member said they were lovely. They were delivered same day and at a reasonable time i belueve so I was happy with service. Flowers are beautiful :-) Recipient very happy and appreciative. Delivery when asked - thank you! Quick delivery and thank you for sending an email with a photograph so I could see what I purchased as we live in the UK . Easy online ordering system and great they send email confirming the flowers have been delivered. Will use service again and recommend to everyone. The service was excellent &amp; super easy to order online as I was de overseas. Really easy to use website flowers and chocolates delivered that day Very pretty flowers a lot of effort went in to it I can see. Love the fact you get photos too. Very happy with the ease of ordering from All for the Love of Flowers in Invercargill. They arrived on time, looking very fresh and beautiful and they followed my directions as to where to leave them should no one be home. I?? ?m not sure how that could be improved! Great job and would highly recommend! Lovely florist, but the bouquet was nothing like what I was expecting, so was disappointed. The flowers chosen was very different. Not a yellow rose in there. Flowers delivered on time, as requested - only ordered the day before! 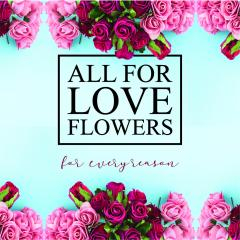 Living in Auckland I searched for online Florists in Invercargill and came across ALL FOR LOVE FLOWERS. What a fantastic company and website. Made ordering so simple, and loved the above and beyond service they offer. Received an email to confirm delivery had been made, also attaching photos of the actual flower arrangement that was delivered. Thank you ladies, you made ordering from one end of NZ to the other a breeze. Love the flowers, love the service. I highly recommend ALL FOR LOVE FLOWERS for anyone needing flowers in the Invercargill area. I was told by the recipient the flowers were beautiful. Love the confirmation and photo. Excellent service. Ordered from UK to NZ - no problem. Photo of flowers was a nice gesture. Excellent service, I live in Australia and the website was easy and delivery quick. Beautiful flowers and prompt delivery. Loved seeing the photo of the flowers. Will use this service again. Thank You! Thank you so much!! My mum was so over the moon <br/>They were great! The flowers & cuddly toy looked lovely & were delivered on time. Excellent service thank you so much. Delivered in a timely manner and on a Sunday for mothers day which was just wonderful service. The recipient loved the arrangement so thank you for such excellent service. Mum was very happy with the flowers. She thought they were absolutely beautiful and smelt amazing. So cool that you email photos of the flowers, especially when you can?? ?t be there to see them. Thank you so much you have done an amazing job. You have amazing customer service. ???? Flowers were great and florist sent a photo to us so we could see what the gift we had sent looked like. Good quality flowers delivered quickly. Arrangement options were easy to follow and offered a variety of choices and prices. Lovely flowers much appreciated by the receiver. I never saw them in person so I wouldn't really know. But I guess it was good. Excellent service. Prompt, efficient and well priced. Photograph of flowers delivered were exactly as I anticipated and delivery was done in a timely manner. Well done I would definitely use All for Love Flowers again. Beautiful, Thank you from afar. beautiful flowers delivered right to my nieces door to cheer her up after surgery. Loved the communication, and even pics of the actual bunch sent. Thankyou very much for delivering my mum such a beautiful arrangement of flowers! Flower arrangement that was made,was even better than the picture I picked off the website. Highly reccommend!!! Thanks heaps again!! The flowers and arrangement were excellent! Have requested All for Love Flowers deliver on many occasions.... always a beautifully presented and well receive bouquet. Great personal service and flowers were beautiful. Will come back. Irene and Jimmy told us their flowers are beautiful. Super easy to order online. Flowers were delivered on time & looked lovely! Thanks so much for your lovely flowers I had you send today. Second time this month we have used you. Fab job. My mother in law tells me the flowers she received were beautiful so Thankyou ?? ?all for love flowers???. Very nice bunch of flowers, and great to see the pics of the final bunch! My sister was very happy with the bouquet and pleased that some of the flowers are in bud. Flowers were excellent quality and have lasted really well. Bigger bunch than I expected - good value for money. No complaints and would recommend. I am impressed with the ease of service and how the bouquet matched what was shown on the website. The delivery was on time and the person who received it was extremely happy. I also received a photo from her. I was introduced to All for Love Flowers earlier this year at the time of a family bereavement and given the range of flowers delivered to us at the time - All for Love Flowers really stood out to me which is why you are now my florist to use!! Stunning . Quick service. Easy to order. Loved the arrangement. Thank you. ???? Flowers were well received and look lovely! Loved that I got a photo of the flowers that were delivered, nice touch!! Flowers were delivered when requested and much appreciated the confirmation email with a photo of the flowers being delivered. Lovely flowers and very happy with the service. A fabulous service & beautiful flowers delivered exactly as we wanted. Will definitely use again. Thank you so much. Helen Richardson. My family loved the flowers, and they arrived quickly and on time. Thank you! Very quick to contact me and resolve payment issue which grateful for. The flowers provided were lovely and I know the recipient loved them too. Thank you for excellent service. Fantastic. The flowers ,I'm told were stunning, And hit the spot to cheer up my unwell daughterinlaw. A beautiful bouquet delivered to our family in Invercargill. They were thrilled. Easy to order and delivered on time. Delivered on the day I wanted and my mum loved them. A very happy mother in law. She was over thr moon. Will be using you again. The flowers were beautiful and well presented. Fantastic florist, the bunch of flowers looked exactly like the picture and they even sent me two photos of the competed bunch. Would definitely use them again. Awesome flowers, thanks so much. The recipient was absolutely delighted with the quality of the bouquet, I found the website easy to use, and the flowers were delivered on time as promised. A very good experience, and I would use All For Love Flowers again. Wasn't the flower bouquet I intended for my mother to receive but My mum Liked them! The flower swhen they arrived were good thanks. Only issue was they were expected to be delivered on Thursday afternoon 27th July according to the website when ordered on Thursday morning but were not received until Friday afternoon. The beautiful fresh yellow toned flowers were bright and cheery, making Mum's winter-time birthday a little sunnier. They were delivered the same day, thank you for the special service! Bouquet was simple but colourful, thank you. Flowers delivered as requested. Recipient is a very knowledgeable gardener and she advised they were a very lovely well constructed attractive bouquet. A nice bunch of flowers delivered on time. Have used twice now and had good feedback from the recipients. Friendly and helpful when phoned. Thank you for good service. ???????? Beautiful flowers, my mum loved them! The flowers delivered were not what i ordered or paid for. I paid for sunflowers and an orchid arrangement was received. I understand that sunflowers may not have been available but I was not informed otherwise. I have the receipt and order confirmation if needed. Great communication. Beautiful flowers. Thank you! Fantastic service and the flowers were beautiful. My mum was so happy to have flowers delivered ON her birthday (ANZAC Day) - thank you! 10 out of 10 well done. Found the ordering process a bit confusing. Great service and instructions followed perfectly. Thank you. Excellent service and lovely flowers delivered on time. Many thanks. Beautiful fresh well presented flowers, put together with skill. Delivered as and when hoped for and lovely flowers, many thanks. Excellent service. Extremely helpful and thoughtful to deal with. The flowers were beautiful and the recipient loved them. Thank you. Not quite as brightly coloured as the one in the photo against which I placed my order but nevertheless the one you delivered was lovely and my friend was very delighted with her gift. So much so that she also sent me a photo of her flowers. So thank you for yet another very good delivery. Amazingly easy same day transaction. Thank you so much! Very friendly and polite, stunning bouquet, the recipient was extatic and grateful. Excellent service . Very talented ???? Excellent service thank you for the sending the photos gave me confidence my money had been spent well was not expecting them to be delivered in the same day awesome service. Thanks for emailing a photo of the flowers. That's genius! I didn't have to ask what they were like. I was disappointed with the flowers. $100 should I would of thought got a decent bouquet of flowers. My sister is a florist, I sent her the photo of the flowers and she valued the flowers at $90 and said exactly what I thought - that it looked like a supermarket bunch. I didn't think that the flowers looked like the website (and I do understand that flowers change for season to season) The flowers on your web should change on the $$ amount to see what size (and I do understand the $100 was not a choice to click on) but had I known that the photo represented $100 bunch I probably would not have bothered. Very happy with our flowers, they looked exactly the same as the photo! I am very happy with the way the flower basket looks in the photo. Thank you. It was lovely to be able to choose from the options shown. Well, my mother didn't ever receive her card with the message I typed out onto your website as it was left behind by the woman who delivered it. So Mum didn't know who the flowers were from. Also, the flowers, although beautiful, looked more like a $50 bouquet than a $90 bouquet. So overall I was a bit disappointed. Really good service! I really liked the flower arrangement and the fact that I was sent photos to show what they looked like. The receipient loved the flowers - they were delivered to work for her and all her colleagues didn't stop commenting on them. She particularly liked the pearls and jewels in the arrangement - thanks so much! My daughter was thrilled with the flowers she received. The process was extremely easy, would definitely use this service again for an out of town delivery. Thanks so much ???? Apparently the flowers were lovely but they were delivered a day before I had asked and there was no card attached. If it wasn't for the fact that we asked if they had received them they had no idea who they were from! 5 stars! Beautiful flowers and brilliant service! Excellent service, beautiful flower arrangement, which they sent me a picture of...... nice touch. Very happy, will definitely use them again. Excellent, beautiful flowers and fast delivery. Flowers delivered the same day they were ordered, I was sent a photo of the flowers from the recipient and they looked beautiful, not exactly like the photo but still very nice. Flowers arrived on time and according to the recipient were absolutely beautiful. It is assuring that even though I live thousands of miles away my order will be dealt with professionally and expertly. Would certainly use again. Didn't have to deal with people directly, but website very simple to use and navigate. Prompt service the next day to the customer directed. Flowers lovely and service quick. However the card with message was either forgotten or had fallen off in delivery. The recipient had to phone the florist to find out who had sent them. My friends were absolutely surprised and delighted with the flower display. Really made their day, Thank you. Would highly recommend. Great service. Thank you. Great service, same day delivery with no hiccups. Really appreciated that I could write exactly what I needed to on the gift card with no character limit. In the circumstances we needed these for, I wasn't prepared to cut the message down. Finally, receiving photos of the actual flowers delivered just topped it off. You guys really do an amazing job, keep it up. I had a question about the delivery so ended up calling the florist. She was very helpful to try and sort out my query. Thank you very much. Beautiful arrangement of fresh flowers. Will use this florist again! Appreciate personal delivery, thank-you. Great service and lovely basket. Thank you. Like it said in the box! Flowers lovely and delivers as per asked for time. Many thanks! mother very pleased with them, this is the 2nd year we have used you. Very happy with flowers , quick delivery. Online ordering user friendly. Very happy with service. Would definitely use again. Great service and flowers as they looked in photo! Recipient was pleased with arrangement though it bore little resemblence to picture advertised. Beautiful flowers, thank you so much. Amazing, thank you so much. The flowers where very nice and you saved my life! A bit skeptical of a third party at first, but everything went well and it was good to be able to track whether delivery had been made. The lady ( I think Lee-Anne, sorry if that is wrong) was very obliging in trying to get me sunflowers, phoned ba k the next morning to say sorry she had been unsuccessful. I was impressed by her customer service. Product delivered did not look like the picture ordered from online website. Very few flowers in it and a lot of greenery. Excellent service, have used this florist before and will use them again. Very professional. Thank you. Love using this place always on time always beautiful products and most importantly very happy and ,polite people. Defintely will use again. I purchased the standard 'Mum's Perfect Day' bouquet for my mother for Mother's Day, it cost $75 altogether including delivery. <br/>As I do not live in the country I truly rely on gifts like these to make my mum's day as special as it can be without my actually being there. <br/>I made my choice based on the image shown. The image did not specify if it was the 'standard,' 'deluxe' or 'luxury' bouquet, so I foolishly assumed it showed the standard bouquet. More fool me. <br/>When my mum sent me the image of her flowers I was embarrassed to find that the bouquet looked nothing like the image I had based my $75 purchase on, and in fact looked quite sparse. <br/>For what it's worth she enjoyed the flowers, but I felt utterly let down and quite sad. <br/>Considering how many other florists there are in Invercargill who actually do show a fair representation of what their clients are actually purchasing online, I will not be ordering from you again. I guess I can consider it a $75 lesson learned. Perfect Fast Service! So Easy and beautiful flowers! My friends were delighted with the gorgeous flowers - very bright and fresh and a nice mix of fresh flowers. Highly recommended, thank you. Thank you very much for the flowers. I was very surprised to receive the email to say they had been delivered. We were thrilled to see photos of the lovely basket. Thanks once again. It was exactly what I purchased and I couldn't be happier. I would definitly use this florist again. Easy to used web site. As usual Angela did a lovely job.... must by now be her best Broken Hill customer! Flowers were a bit more modern/funky than I would have liked but I forgot to specify it was for an older person's funeral so that's my fault. Great Service - pictures provided of flowers delivered. The images on website are very misleading. Small bunch was the same size as the large bunch of flowers I ordered. Also cheaper cut flowers seemed to dominate the arrangement. The recipient has told me the flowers are beautiful - I'm sure they are! Pleased they were delivered on the day of order. Great service! It was a very special moment in my daughter's life - a graduation ceremony....and we couldn't be there with her, but flowers you delivered was beautifull and she knew she was not alone! Thank you! Easy to use, great service upon delivery and the person I ordered them for loved them!